Nobody in the Open Source community was happy when Oracle bought Sun Microsystems. That unhappiness has led directly to LibreOffice, the provisional name of a community-led fork of OpenOffice, to be developed under the umbrella of a European based non-profit organisation named the Document Foundation. It seems nobody believes Oracle is a good custodian of Free/open source software. Not since Lounge-lizard Larry Ellison cancelled Open Solaris on the way to buying his eight super-yacht. This week. "We believe that the Foundation is a key step for the evolution of the free office suite, as it liberates the development of the code and the evolution of the project from the constraints represented by the commercial interests of a single company." Most of the major open source players have pledged support; the Free Software Foundation, Google, Novell, Red Hat, Canonical, the OSI, the GNOME Foundation, NeoOffice, Credativ, NeoOffice, and others. 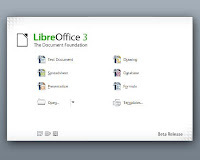 Oracle has been invited to support The Document Foundation, for instance by donating the OpenOffice brand. Ha, ha ha. Good luck with that. Much of the early work will focus on polishing the code and lots of clean-up work, but in the future we can expect a more responsive and hopefully a more productive development cycle. The fork removes the requirement that copyright be assigned to Sun (now owned by Oracle).